This post is one part of the Watchdog Series. In theory you don’t need to create a gallery but I think it’s important to not only have a lot data but also have a good overview about it. Also it’s very important to be able to show other people a problem by just giving them an URL without having them crawling through folders. That’s why I wrote a second program which creates HTML files. Those you can easily watch or share their URL with colleagues to show them a particular problem. The main gallery shows one thumbnail for each image collection we have. This gallery gives you a good impression of the color-variety of your game and sometimes you can see problems just by eyeballing some pictures for example if a whole planet is pink because its texture is missing or something like that. Pictures which were created at the same day are marked blue. The iteration which is currently shown as big picture is marked green. Per default the latest screenshot is selected and by hovering over another one you can compare them. If you want to not compare with the latest screenshot, then just click another one and it will be the new default. 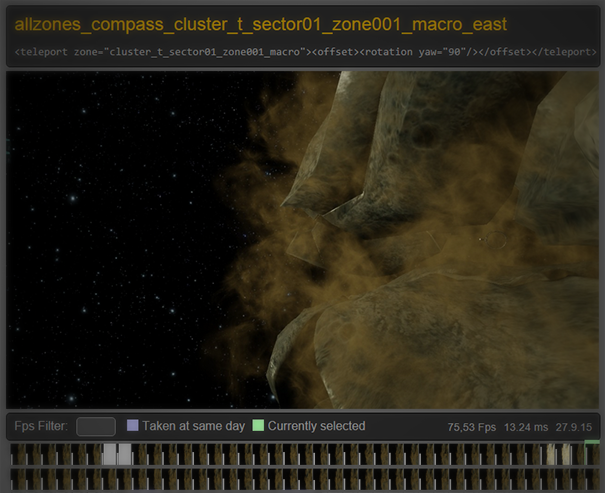 Not only image data but also meta information like the FPS are shown (the data is read from the TXT files which were created along the images). 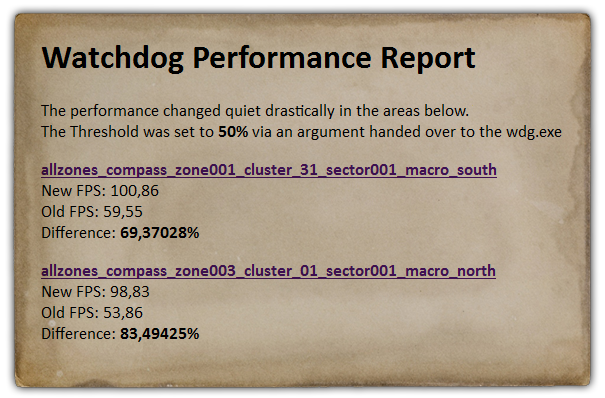 In addition you can see performance-bars left to each thumbnail and see how the performance developed over time. Since we’re already reading the data from TXTs we are able to compare the latest FPS values with the ones in the past and send out warning mails if the performance raise/drop is too drastically. This systems needs some additional work and problems we observed are written down here. Continue with the next part: Problems. This entry was posted in Workflow Tricks on 4. October 2015 by Simon.